Theodicy--the vindication of divine providence in view of the existence of evil. Christians posit a Good God created everything, the universe, the world, and the birds and the bees, etc. But we distinctly live in a world with evil in it. There is injustice, great suffering, pain both physical and mental. The Problem of Evil is the whole reason that the theological consideration of theodicy becomes such a conundrum for Christians--because not only do they have to answer for the evil in the world, but they must also explain why a Good God would allow for it. Theologians do this in various ways, most frequently invoking free will as an excuse to bring about original sin and through sin the perishing of the world along with all the evils which come along with it. Yet this line of reasoning fails to account for the suffering of animals or that suffering which is caused by natural disasters such as hurricanes, tsunamis, mine shaft collapses, so on and so forth. Another common objection is the so-called problem of good (the inverse of the problem of evil) which basically states that there is good in the world so how can you account for it unless God was at least partially good? Never mind that evil is naturally occurring, such as suffering and pain, whereas good events are not naturally occurring--that is to say nature remains indifferent to our happiness and well being (a fine day is not sunny and warm just to make you happy but the wind could very well blow over a tree which comes crashing down on you causing you severe pain and even crippling injuries). However, before they can even get to this point in the argument they have to justify all sort of strange theological exegesis to justify an unfounded metaphysical claim (i.e., that sin is real) and often choose to ignore any criticisms which may find fault in their fly by night theories. But I have a possible solution--a much simpler theory--an inference which not only accounts for why there is evil in the world but will still allow for the possibility of God. Here's my theory, take it or leave it. Putting aside esoteric theological considerations, ad hoc harmonizations, and poorly conceived Christian apologetics, minus all the ifs and buts, I am inclined to agree with Stephen Law, namely that the best explanation which does away with the problem of theodicy is that God is evil! Before you get bent out of shape hear me out. 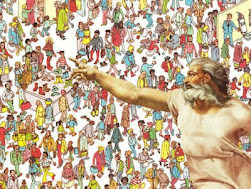 If God is *all good--then the creation of a world where evil, pain, and suffering are all very real is a major problem (since no all loving or just being would allow for it to begin with) which means one of two things: either believers are completely wrong about the nature of God (i.e., God is not all good), or their God simply does not exist (i.e., pain and suffering exist in a natural world apart from supernatural entities or metaphysical states). Now the theory of a capricious, pernicious, or even malevolent God explains why there would be evil in the world and therefore explains away the Problem of Evil. Most Christians, I think, will object to the fact that God (as they understand it) could be evil. Sure, I'll go with them on this (assuming the God of the Bible is not the best representation of God), but then, this means the best inference which accounts for evil in the world is that God is non-existent. Oops! Pain and suffering do (undeniably) exist in a naturalistic universe and often have regrettable consequences, and thus the Problem of Evil is a bane for the theologian and a boon for the atheist. Indeed, it seems to be positive evidence (via induction) that minus God we know that evil would still exist and we know this to be true (via deduction) because we are stricken by evils daily. So no amount of appealing to God's goodness will solve the problem or explain away the contradiction. Changing the definition of God (by redefining his character as to allow for evil, etc.) merely appeals to the first objection, that believers simply haven't understood the nature of their God, and in ad hoc fashion, must change their definition of God to work around the problem. This is, contrary to what they may believe, strong evidence that they have no real (or clear) understanding of God (should he exist) and therefore their claim of God's "goodness" is without support. Yet having failed to establish a believable concept of God which simultaneously accounts for the problem gives them no basis for support that their concept of God is even very practical, meaning that the very existence of evil fully negates their concept of God (and changing the way they define God only reinforces the dilemma). Thus we are left with option number two as being the more probable one: no *actual God exists. In conclusion, Theodicy and the Problem of Evil leads to one of two possibilities, both antithetical to Christian belief, either 1) God is capricious, pernicious, perhaps even evil or else 2) God is non-existent. Knowing this we should have no problem rejecting the notion of evil-theism any more than we would a theism which posits a good God but is logically and philosophically incoherent. One of my favorite theologians and biblical historians Bob Price does a wonderful podcast about NT Criticism. Price answers questions and emails about all things related to the Bible. It's very insightful, it packed full of information, and capture's Price's unique and quirky sense of humor as he addresses your concerns. Some of the best exegesis you'll find online by a professional scholar, so please, be sure to check it out! This weeks overview: Does Margaret Barker reject the JEDP theory? Does Minimalism undermine it? Did OT people believe in an afterlife? 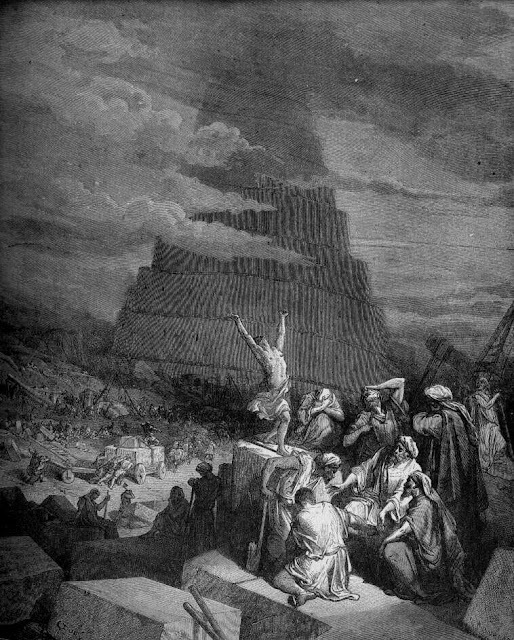 How about other Canaanites? Did NT era Jews keep genealogical records? Does the Bible really teach eternal punishment? Counter-cultural self-congratulations of self-styled radical Christians and why they vilify America. How could the ancient rabbis have canonized a scripture filled with various viewpoints and philosophies? Rabbi Tovia Singer's claim that only the LXX Pentateuch was translated by Jews, the rest being the later work of Christians, and that "parthenos" did not mean exclusively "intact virgin." Did Jesus have to go to the bathroom? Mark Goodacre's argument that Luke knew but rejected Matthew's nativity story. A not so Christmassy X'Mas! Here's the breakdown of my Christmas in Japan. It's more or less the same secular, non-Christian, holiday I've been celebrating for the last five years. It starts with a light show in Shobara, where the illuminations dazzles our weary eyes with twinkle lights. The frigid air nips at our cheeks and we retreat to a 400 year old Japanese styled tavern where we sit in a warm kotatsu (obviously a recent renovation from 400 years ago) although the actual pit fire rages on by the entrance. We eat a lovely zenzai (mochi rice dumplings in red sweet bean soup) which is a traditional winter food in Japan (i.e., think of hot chocolate). Christmas day we head to Amakusa (famous for the Christian revolt lead by Shiro Amakusa in 1638). There's your Christian part in my Christmas. While in Amakusa we stop off for lunch at a new seafood restaurant. It was about $15 dollars for an amazing Japanese style platter. Then we head to the boat, which has been sitting in the bay with a rundown battery. After putting around the bay for a while, the white caps getting to high for a local trawler, we head back into shore. Returning home we get ready to head out to the Ringer Hut, a champon fast food franchise where I eat one of my favorite Japanese styled food, a Nagasaki dish called sara-udon (but it's not udon). 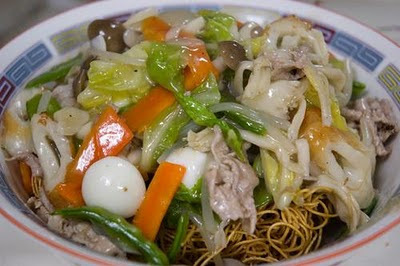 It's basically champon styled sauce mixed with a cabbage stir-fry and pored over crunchy fried noodles. It's delectable! After dinner, still a little hungry, we stop by a yaki-tori vendor and buy some grilled chicken out of the back of a van. I know what you're thinking... sounds a little dodgy... but they're everywhere in Japan and it's well worth it. Standing in the cold eating hot chicken styled kabobs. I wash mine down with a cold Coke I retrieved from the vending machine. A Santa Claus adorns my cola, reminding me what I had almost forgot, today was Christmas. When faced with stubborn believers who think the onus is on the atheist to prove that [G]od *doesn’t exist, I think they’ve missed the point of the argument they are trying to make (which makes them look like they don’t actually know what they are talking about—which does not reflect well in their favor). You can’t make a positive claim (a claim which affirms something) then turn around and expect someone else to prove a negative (a claim which hasn’t affirmed anything). It’s illogical—and shows an inability to reason properly. This is why atheists will often remind believers that, not only is the burden of proof on the one making the claim, but also that extraordinary claims require extraordinary evidence. Extraordinary evidence is whatever evidence would be required to sufficiently prove an extraordinary claim. For example, say I was in possession of antique oil lamp, but not just some ordinary lamp, a special magic lamp with a magic genie inside! Now supposing I told you that this magic genie inside would grant you three wishes if you rubbed the lamp, what sort of evidence would you need to prove such an extraordinary claim? Simply put, you'd need to produce either the genie or support your claims by fulfilling three wishes which could only be performed by said genie. In the end evidence is evidence, but the grander the claim the more demanding of a need to support that claim. It's as simple as that. Personally, I like to use the comparison of a magic genie in a lamp because it is analogous to the [G]od-concept which theists posit in favor of the existence of [G]od. It’s not your obligation to disprove that I don’t have a magic genie any more than it’s my obligation to prove that God does not exist. *You not being able to prove my magic genie does not ever enter the equation, because we both know, there is no evidence for magic genies which would establish their existence in reality. The same can be said for the existence of [G]od. Moreover, it’s not your burden to prove to me that there are no such things as magic lamps with genies inside, because we all know that you’re not the one claiming to have a magic genie—I am, and since I am making the incredible claim I am the one with the sole burden to prove my claim true. The way we prove something true is by using science. Science is the intellectual and practical activity encompassing the systematic study of the structure and behavior of the physical and natural world through observation and experiment (Oxford Dictionary of English 2005). So if you want to prove something is *real, then you use science. If science fails to establish any consequential effect, either directly or indirectly, of what it is you propose exists—then chances are you may want to re-evaluate your claims. That is, we must fit our theories to the facts (not the other way around). Science doesn’t concern itself with the non-existence of something. The periodic table of imaginary things would be too big for a classroom- infinitely big in fact, and rather pointless. It’s not trying to prove the non-existence of anything supernatural. All it knows is there is no scientific proof of anything supernatural so far. I couldn’t have put it better myself. Indeed, it is precisely because there is no evidence for magic genies in lamps, or for that matter [G]od, that we can’t just assume the existence of magic genies or God. As science would seem to suggest, when it comes to supernatural things the best stance we could presume to take with regard to their existence is one of agnosticism. Agnosticism being the default position then makes it rather presumptuous to claim that the supernatural is real (minus the evidence) and it is more than a little bit mistaken to assume the burden to prove *your claim is on everyone else. Proving things exist, on the other hand, is easy when it, in point of fact, actually exists. I can very easily prove to you that I have an apple sitting on my desk next to me as I write. I could describe it to you, take a picture of it, or better yet film a video of me eating it and then post it on YouTube. Of course, if this fits with your experiences eating apples, and other people who can corroborate and confirm it fits their experience of what eating apples is like, then chances are I really did have an apple (which I then ate). Proving that my genie in a lamp has magic powers and will grant you three wishes if you rub it a little bit requires a whole lot more evidence than I am capable of producing as to even make my claim believable. The same goes for the existence of [God]. That fact that proving things exist is (typically) easy doubly confounds believers because, as they well know, if their idea of [G]od actually had a referent then their claims would be much easier to support—in fact their claims would be so well backed by a superfluous amount of evidence as to constitute as obvious if not completely undeniable. But to the chagrin of the believer, the reality of the situation is, the concept of [G]od has no empirical basis for support (in reality). 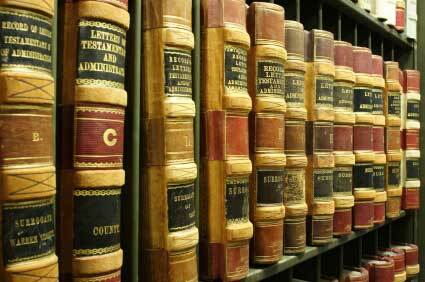 In Law there is a scale of evidence which leads one to make the informed decision before presiding on a verdict. It’s no surprise that evidence for [G]od lies at the bottom of the scale—not even a scintilla of evidence. 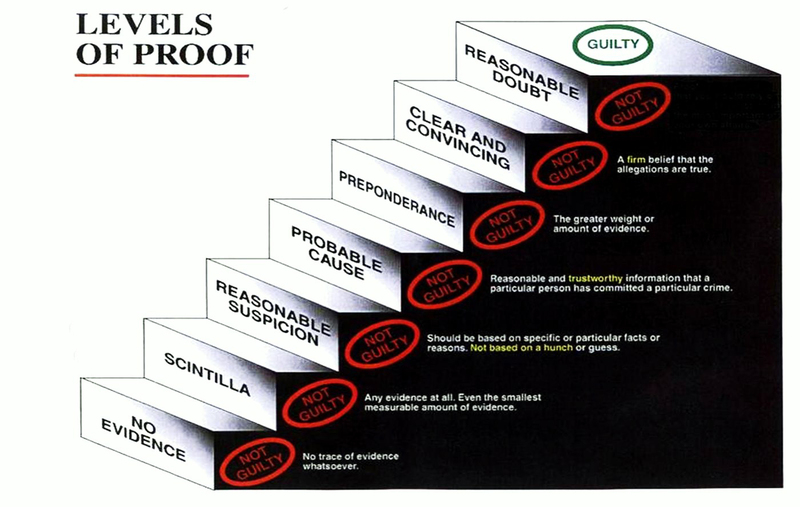 So before theists can even presume to have won the verdict on the [G]od debate they first have to make their case—and this does require producing genuine evidence. No evidence means no case can be made, and this is exactly where we find arguments for the existence for [G]od today—they just don’t pass muster. Meanwhile, the claim that [G]od is transcendent, that he exists beyond space and time, simply is an admission that [G]od cannot be proved to exist—and thus the theist shoots themselves in the foot by making their idea of [G]od wholly untenable, because they have now made it impossible (even for themselves) to prove whether or not he actually exists. Many theologians bemoan the fact that atheists don’t take the transcendental argument seriously, but we don’t take it seriously for these reasons, it’s not reasonable let alone even plausible—and all it seems to do is safeguard the [G]od-concept from being disconfirmed entirely (i.e., it is a way to salvage the mere idea of [G]od). Even so, the standard for what is reasonable to believe has been set by science, and where there is deficient (or a complete absence) of evidence one must tacitly admit that, as a consequence, there can be no real reason to believe in unsubstantiated claims other than the fact that they want to believe—that is to say the transcendental argument merely allows for a way for the believer affirm a belief in belief (even as [G]od proves to be imaginary). In conclusion I find no good reason to believe in the concept of [G]od. In a world with working logic and the powerful methods of science the [G]od-concept grows more and more tenuous by the day. The more knowledge we accrue the more difficult it becomes to affirm, let alone establish, feasible reasons to believe. On top of all this, the fact that theists (from all faiths) have failed to meet the basic standards of proof shows that they are simply whistling into the wind, and perhaps, would like to rethink things before they (predictably) try and reverse the burden of proof. Over 20,000 Page Views in One Year!!! Happy Holidays everybody! As we are packing up to head home for winter vacation I just checked my page stats and found I had over 20,000 page views! That means I got an additional 10,000 page views in just a couple of months! Thanks for all your support and have a Merry X'Mas and Happy New Year! Often times I get asked what I think the best argument against God is, you know, other than the fact of not having any evidence. If you ask me, it boils down to a semiotics issue. The concept of God is so ill conceived that it only leads us to a form of theological non-cognitivism (e.g., ignosticism). Ignosticism is the position that all current definitions and conceptualizations of god are so multifarious, so habitually obscure, or so incomprehensible as to be impenetrable to human understanding as so no real knowledge can be had with regard to god’s true nature. Basically, since most god concepts frequently contradict or negate other rival definitions no one definition can be held as exclusively right. For example, although both Christians and Muslims believe in the God of Abraham, the Christian God having begot a son, which Christians believe is Jesus Christ, yet according to Muslims Allah does not beget sons. This contradiction clearly makes these rival terms incongruous—and so the problem arises of whether or not either concept of god is correct or if they are both wrong. Such examples show that contradictory concepts of god render the original opposing definitions of any one particular (even personal) god moot since the definitions themselves could only be either projectivist or prescriptive. What this means is that either the person of faith is projecting their own hopes, desires, and theological understanding onto the nature of their god, or else, they are supplying a term with a favorable set of properties which will coerce you into agreeing with them because of their particular theological conditioning. But the danger here is that they neither require proper knowledge about god or cognitive awareness of said god to formulate such concepts—this means every definition of god today is non-cognitive (i.e., lacks both the properties of possessing knowledge and/or being cognitive). If you take the time to think about it, every definition and working concept of god today fits this non-cognitive profile. Theological non-cognitivism, or ignosticism, requires genuine knowledge or genuine cognitive awareness of god (or both) for any god concept to be deemed correct. This failure to provide a universally coherent definition and concept of god means that ignosticism is strong evidence in support of the atheist and agnostic positions. Now consider that all religions all over the world have their own competing definitions and concepts of god. Even within faiths there are denominations and sects with competing definitions and concepts, most notably the Christian schism of Catholic, Eastern Orthodox, and Protestant faiths along with each of their sub-denominations (each with their own accompanying definition and concept of the Christian God). Until a coherent and universally agreed upon definition for god can be set, the truth is, no real debate can take place on the existence of god. As it happens I received some extremely helpful feedback from a couple of my manuscript readers. Each one offered the same advice, and so I knew it wasn't simply a coincidence. In each case the advice was basically this, "It seems as though you have two books in one. You might want to try separating the religious history from the atheist discussion and try making one or the other--or both--into independent books." After thinking it through I decided to do it, and after some cutting and pasting an entire new book emerged out of the larger bulk manuscript. 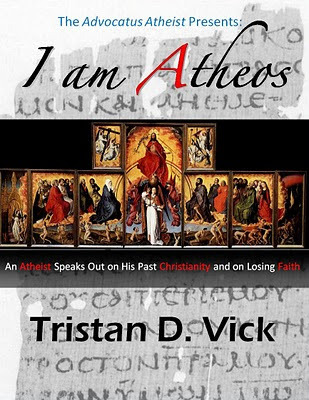 This also streamlined my main themes in the I am Atheos book making it much more on point while giving the religious oriented piece a life of its own. Meanwhile, the second book has become my 'Why I am Not a Christian' explication. 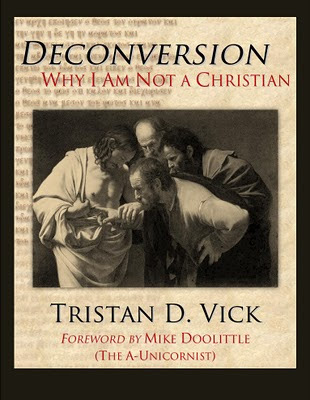 Thus I have chosen to simply title it Deconversion: Why I am Not a Christian. Here's the tentative cover for it. The New Atheists: What Are They Good For? Many religious thinkers perceive disagreement as a denunciation of their beliefs. A brief survey of the backlash of Christians, and religious folk in general, to the New Atheist authors such as Richard Dawkins, Sam Harris, Christopher Hitchens, Dan Dennett, and Victor Stenger reveals an overreaction disproportionate to the alleged offense of religious intolerance. What appears to be happening here is that the religious are conflating irreligion and religious intolerance for one and the same thing. But they’re not. So what we may say to those who insist that only those who believe, only those with a deep appreciation of the sacred are to be entrusted with the investigation of religious phenomena, is that they are simply wrong, about both facts and principles. They are mistaken about the imaginative and investigative powers of those they would exclude, and they are wrong to suppose that it might be justifiable on any grounds to limit the investigation to those who are religious. Believers may feel their position is accosted by those intellectual heavy weights such as Richard Dawkins, Christopher Hitchens, Sam Harris and company holding glaringly contrasting beliefs, but believers needn’t feel like they’re being talked down to. In fact, if you follow the new atheist train of thought you will realize that they are extending the olive branch of friendship by wanting to engage in discussion and debate about religion with believers. Without a doubt, the new atheists adamantly believe that truth springs from argument amongst friends. Even as the new atheists mean well, they can occasionally come off as callous. Perhaps it is because they are strict rationalists and tend to be idealistic, or maybe it is because many of them are college professors and their jobs are to keep us questioning. Either way, I too understand the frustration of having someone contend my beliefs and values (let alone criticize them). When I first read Dawkin’s the God Delusion I was still a passionate Christian and there were more than a few times I got so irate reading the darn thing that I threw it up against the wall! But after huffing and puffing and counting to ten, I stopped to ask myself what had made me so angry? Why did I overreact in such a violent and destructive way? I think part of my frustration was that I couldn’t for the life of me even begin to answer all Dawkin’s criticisms. They were too many, razor sharp, and rationally sound. What’s more, the more I grappled with them in my mind the more they began to make sense! Not being able to defend my beliefs made me even angrier than the fact that someone challenged me to do so! Needless to say my copy of the God Delusion is well abused. 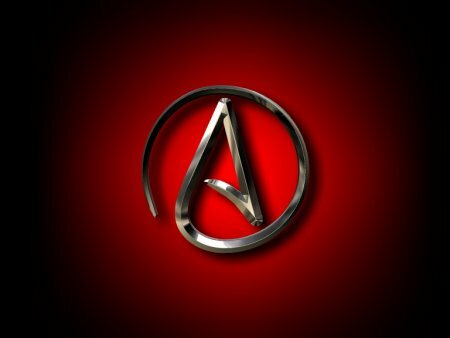 Are Atheists Rebels Without a Cause? Renowned theologian William Lane Craig has stated irreligious attitudes such as atheism arise from the rejection of Christ’s love and the denial of the Holy Spirit (even as such shamelessly unsupported metaphysical claims don’t impress the New Atheists any). In his book Reasonable Faith, Craig states that, “The Bible says all men are without excuse. Even those who are given no good reason to believe and many persuasive reasons to disbelieve have no excuse, because the ultimate reason they do not believe is that they have deliberately rejected God’s Holy Spirit.” Yet Craig’s assessment is horribly illogical. First of all, the assumption that other people believe in a god, or a spirit, let alone your concept of god is egregious. Craig overlooks the facility of the genetic fallacy by assuming everyone in the world thinks “Christian.” That’s a colossal mistake. Second of all, I could very well counter by asserting about the lack of belief that “Reason says all men are without excuse. 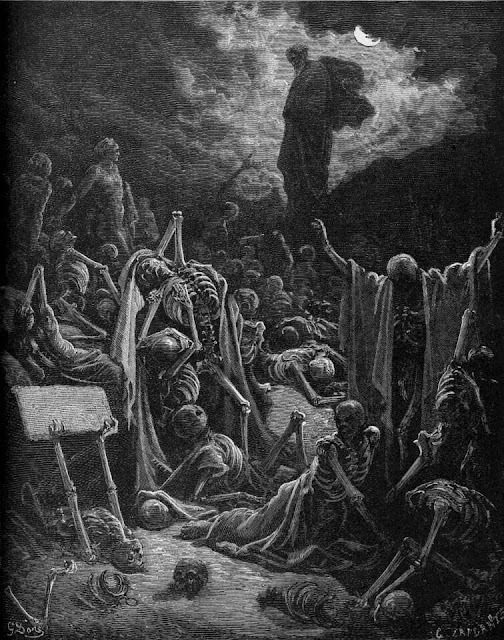 Even those who are given no good reason to believe and many persuasive reasons to disbelieve have no excuse, indeed the ultimate reason they do not believe is that they have no good reason to.” It seems my argument is equally valid when talking about what is reasonable to believe, finding that contrary to what Craig may espouse, the lack of belief is more reasonable than faith. Next, Craig’s hypothesis lies not on any empirically tested theory supported by evidence, but on his religious conviction that the Holy Spirit is real, and that those without it are biased against those with it. Beggers can’t be choosers (pardon the pun). On both accounts Craig’s claims are unsupported and wholly incorrect. How can I be sure? Because I know many kind hearted atheists and nonbelievers who would never stoop so low as to decry someone simply for holding a difference of opinion or having unlike beliefs. They are perfectly content to let Craig believe in stupid things as long as he doesn’t needlessly inflict such stupidity on anyone else. It’s only when those with an imaginary friend decide to call us nonbelievers without an excuse for not believing, as if we’ve failed to get it, and label us as woefully wrong. On top of this they like to add that we’re immoral, and then feigning to care for us even as they condescendingly make our nonbelief into an unforgivable crime whilst promising we’ll suffer (literally) for not agreeing to believe in their imaginary friend with them. More absurd still, they actually feel they have a right to come knocking on our door to remind us of it. Such self-righteous impolite intrusions into our privacy and personal lives, I hope you’ll agree, is a little worthy of scorn. Furthermore if the Holy Spirit, or God for that matter, was at all tangibly real then theologians like Craig would not have to write so many tomes of apologetics explaining why it’s “reasonable” to believe. Craig’s philosophy of “I know, because I know, because I have the ‘Holy Spirit’ so I know” is a circular, fallacy driven, piece of drivel which if presented as a paper at a institution of higher learning would be the surest way to get a failing grade. Other theologians simply offer new atheism is simply a regurgitation of the classic arguments of atheism, which they find unsatisfactory, and dismiss it without ever considering what it has to say. One such offender is Oxford’s Alister McGrath, author of The Twilight of Atheism: The Rise and Fall of Disbelief in the Modern World, who seems to think that atheism is on the way out (even though polls show the statistical trend to be the opposite—atheism and nonbelief are rapidly growing—disproving McGrath’s claim). He also thinks atheism is the ‘active rejection of the belief in God’ (i.e., disbelief; I’ve already addressed this misconception in chapter two). McGrath also finds atheism is a complete moral failure (although atheism isn’t a moral philosophy, is neutral with regards to ethics, so how could it possibly be a moral failure?). If a believer brings up Adolf Hitler, Joseph Stalin, Pol Pot, Mao or any other quasi-atheist extremist-lunatics as having committed the worst “atheist” atrocities the world has ever seen, how are atheists to respond? If we cited the numerous religious atrocities the religious adherents might point out that the numbers, after having been tallied, are not even close to being equal. True enough, so called “atheist” regimes have killed far more than religious regimes, albeit for different reasons—none of them pertaining to a lack of belief in supernatural beings, and only in isolated incidents where economic hardship and political corruption was rampant. But religion as a whole has killed far more over the course of history, and the differentiating aspect is that it continues to do so. While they regularly fault religion for its role in promoting conflict and violence, secular writers rarely examine the role of atheism in producing wars and killing. It’s interesting that we routinely hear about how much historical suffering religion has caused, but we seldom hear about how much suffering atheism has caused. Five hundred years after the Inquisition, we are still talking about it, but less than two decades after the collapse of “godless Communism” there is an eerie silence about the mass graves of the Soviet Gulag. Why the absence of accountability? Does atheism mean never having to say you are sorry? How does not believing in Zeus, Thor, or Athena (or any other god: forgotten or currently worshipped) lead to the Soviet Gulag is what I’d like to know? How does a cognitive position based on reason and a rational deduction, which honestly admits that we cannot prove the existence of God, let alone those lofty claims which are so regularly made on his behalf, lead to the consequence of mass murder? While I think it’s true that atheism did not provide an obstruction to wars and killing, neither was it used to justify or legitimize them. Religion, on the other hand, is routinely invoked to validate violence against others, particularly outsiders and those not in the in-group. D’Souza obviously has some explaining to do if he wants us to seriously entertain the idea that lacking the belief in something causes a onslaught of murders. How, I’d like to know, would a naturalistic atheist who is well informed about the world and relies on science, and who understands our basic evolutionary history, our shared genetic heritage, and has no qualms with different races since she knows we are all (ultimately) one and the same at the genetic level end up enacting the horrible genocide as Hitler did witht the Jews? D’Souza intentionally gets it wrong in order to deliberately assault atheists in a petty move to reiterate the religious propaganda which so adamantly wants us to believe that atheism is void of morality. Yet this patent subterfuge to spread untruths while making erroneous claims only seems to work on the stupid. Something which D’Souza knows, which begs the question, does he genuinely take his audience for illiterate dupes? D’Souza’s claim that God is a source of morality (so everyone has an innately built in morality) and that atheism is devoid of morality because it isolates itself from the source by rejecting that morality (e.g., rejecting God), but this is a metaphysical assumption to begin with, not an observation. Regardless of whether an objective moral sources exists apart from us or not, the question we need to ask is: when we look at the great religious excuses which have allotted for such heinous crimes on the behest of religion over the course of the centuries, are we supposed to derive God’s great morality from the atrocious examples that have scarred the annals of time? Let’s be clear, to hold religion accountable for crimes enacted out of faith, such as honor killings, hate speech against gays and ethnic minorities, or murdering abortion doctors in the name of God is not only pertinent, but it’s our necessary moral obligation. Christopher Hitchens pungently points out in his book god is not Great: How Religion Poisons Everything, that the case against secularism is a last ditch attempt by the religious defenders to avoid having to take any culpability in the religiously backed, shamefully ignored, myriad of political pogroms done explicitly in the name of faith. After a long chapter of jogging our memory of religions involvement in such unethical regimes as Nazism and Stalinism, Hitchens reminds us, “Those who invoke ‘secular’ tyranny in contrast to religion are hoping that we will forget two things: the connection between the Christian churches and fascism, and the capitulation of the churches to National Socialism.” Dinesh D’Souza may be willing to overlook the broader facts of history, but anyone who is generally concerned with the bigger picture and seeks to find out the unadulterated truth cannot brush aside religion’s well-known role in the matter so easily. Contrary to what those like McGrath and D’Souza might state in their apologetic works—atheism does not kill in the name of a non-existent God which we don’t believe in. Such an accusation is just a brainless attempt to devalue the atheist—and it fails miserably. This tiresome brand of Christian self-importance and constant mislabeling and bothersome misconstruing of atheists and atheism may be the continued reason atheists react with mockery and ridicule in response to such flabbergasting religious twaddle and claptrap. However, this still wouldn’t explain where the real scorn and resentment of religion comes from or the urge to oppose it. And this is where religious apologists have failed in understanding the substance and purpose of New Atheism. The way I see it, the purpose of the New Atheist movement is to mount a challenge to believers who take their faith for granted. But despite having genuine answers or explanations available to them which may address many of their real world concerns (without having to invoke the supernatural), they continue to ignore what science says and instead choose to rationalize away their cognitive dissonance in order to continue to believe in unbelievable things. Oddly enough many choose to keep believing in impossible things even as these things are cast into doubt if not thoroughly debunked—such as the power of prayer (and by extension all healing miracles). New Atheists are going beyond merely their absence of faith to the harder hitting position of anti-theism, the opposition to theism, making the case that the religious aren’t being realistic enough when they invoke the supernatural or appeal to their faith. Fruthermore, the New Atheists are alleging that the religious aren’t evaluating their faith dispassionately and in many cases that they aren’t even examining or holding their beliefs up to scrutiny to begin with. Thus whenever religious believers demand special privilages such as not being criticized we take special umbrage at the mere suggestion. Respect isn’t something that is freely given, it’s something which must be earned, and if the religious want respect for their position then they’d maybe like to hold back on the special pleading and hypocritical double standards and might like to start treating religious faith half as seriously as the New Atheists do. Even as it is the person of faith’s prerogative to believe in the metaphysical, the supernatural, and the superstitious we might remind them, it is our prerogative to call them on it. This is the New Atheist movement in a nutshell. The common opinion among the faithful is that we hardened atheists only want to live according to our own rules and moral standards, and (for reasons beyond me) are embittered, have rejected the “truth” and turned away from the saving grace of God, and all this just to live out our hedonistic lives in peace. Atheists get labeled as intellectual snobs who are overly critical of everything. But these illustrations are not even poor stereotypes—they’re strawmen. Atheism is much more nuanced and atheists are much more complicated than religious apologists would let on. Whereas the religious often quip that atheists have misunderstood religion it appears the opposite is true—most atheists understand religion just fine, it is the religious who haven’t fully understood atheism. The recent backlash of Christian apologists reeling from the flurry of new atheist literature proves as much. How often are Dawkins, Dennett, Harris, and Hitch up on the podium defending the secular, humanist, and atheistic worldviews against those who deem it somehow lacking, deficient, or void of any moral value? Even though they have no foundation to stand on, apologists will respond to nearly every new atheist argument which they disagree with in yet another series of apologetical counterstrikes, e.g. Answering the New Atheism: Dismantling Dawkins’ Case Against God, The Dawkins Delusion, I Don’t Have Enough Faith to be an Atheist, and The Deluded Atheist and so forth, just to defend their narrow perspectives against an avalanche of new scientific challenges, provocative insights, or radical ideas which don’t include the idea of god as the end all. Apologetical materials can be frustrating to read as most Christian apologetics is uneven and frequently the messages are too tightly packed to make sense of (with equivocation fallacies galore). Some of it is written by scholarly theologians, ala J.P. Moreland, meanwhile some is written by laymen writing far outside of their respective field, ala J.P. Holding. This lends an uneven, even confused aspect, to Christian apologetics. Much of the popular works are aimed at mainstream Christians, regurgitates doctrine and twice-baked devotional convictions, and makes reading for the nonbeliever both boring and unengaging. Additionally, I find most Christian apologetics are poorly written, frequently distort scientific facts and get basic history wrong, and on top of these deficiencies the philosophy is confined to a diminutive theological box, and so nothing novel is ever gained by reading apologetics. Making matters worse many apologetical works are seemingly filled with an endless string of poor grammar, incorrect citation, useless anecdotes, fallacies, and clarification issues, and flat out distortions of the truth—and I’m not the only one who thinks Christian apologists frequently lack academic rigor either. In his book The New Atheism, Victor Stenger discusses the scholarly laziness of Christian apologists in biting detail. Does this mean you must be a professional historian or theologian to comment on religion? Of course not! But it helps to know what you’re talking about—just a little bit—and more importantly, it helps to know how to write. Even so, at the end of the day it’s not about being a great rhetorician, but it’s about being able to back up your claims—and this is why I find apologetical works inevitably fail—because by the time you come to the end all you have is a collection of unsupported, unfounded, or completely incredible claims minus any evidence whatsoever. In other words Christian apologetical material is little more than white noise, background interference, and does little more then put your brain to sleep like a bad infomercial. Personally, I feel the apologists’ time would be better spent investigating the new scientific challenges, insights, and ideas raised by the New Atheists instead of just trying to contend with them. Debate is good but being argumentative just because you are being forced into having to defend your faith is never a convincing sign that your faith has any staying power. To date I haven’t read an apologist I’ve found even remotely convincing. Be that as it may, anyone who treads into the dangerous territory of religious criticism must realize, to ask about the nature of [G]od and religion is to directly challenge faith, and as we all know this is a sacred cow on the path to understanding which many people vehemently steer away from. “Do not disturb the sacred slumbering cows,” they surreptitiously chant, “for they are holy and we must not go there.” But when nobody is looking in come those pesky cow tipping atheists who ruin everything by revealing that cows—sacred or not—are just as susceptible as everything else to natural laws (such as gravity). Holy cows turn out to be plain old beasts of burden—and we like the sound of the thud (THUD!) they make when toppled. Believers aren’t the only ones who don’t exactly understand what atheism is or what it necessarily means conceptually. Even nonbelievers, agnostics, and atheists themselves have been known to get it wrong sometimes. The atheist philosopher Julian Baggini has stated about new atheism, “In short, the new atheism gets atheism wrong, gets religion wrong, and is counterproductive.” However, I feel Baggini’s comments are not entirely accurate. Although he is entitled to criticize the technique and methods of new atheists in how they go about debunking religion and supernatural superstition, I strongly disagree with his comment that new atheists have missed the point about atheism or religion. Many of us atheists, after all, used to be passionately religious. Baggini, on the other hand, makes the common mistake of attempting to define atheism as a single philosophical system, and attempts to holistically group all atheists into the same mind-set, rather than what it is, a cogent position derived from a diverse assortment of philosophies, or as I identify them, influential appreciations. Baggini’s atheism does not depict atheism as it is, but rather refers to the religious stereotype of atheists as holding an incorrect philosophy (otherwise how else could atheists get it wrong? 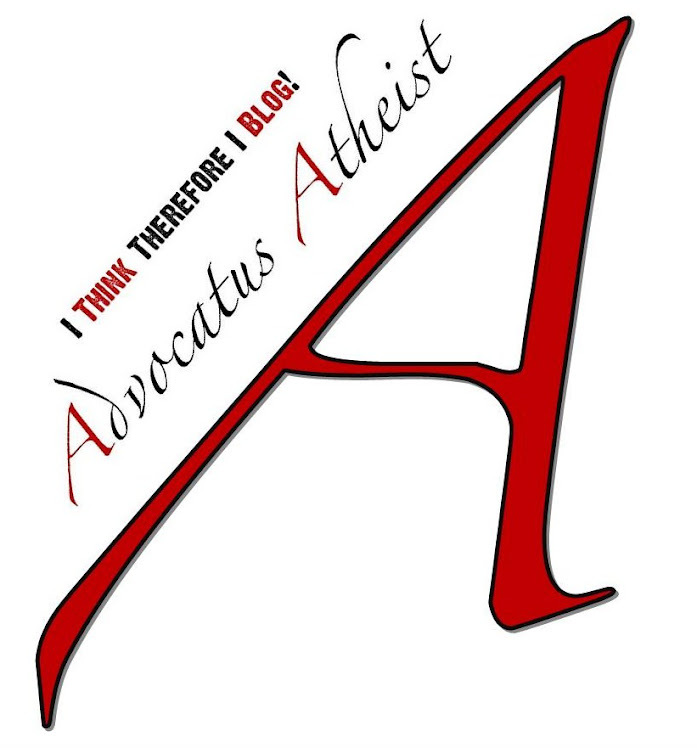 ), and thinks atheism is a dogma of sorts (otherwise how could it be counterproductive?). Baggini extends his criticism of new atheism too, stating that he believes reason is a tool which all rational minds are capable, and asks if all believers are under a “spell” or “delusion” how can intelligent and rational people still believe in God? Baggini cites this as a flaw of new atheism, which hasn’t explained to satisfaction how it holds that religious believers are irrational and so cannot reason on the intellectual level as supposedly the new atheists do. Although our discussion in part two about the recent findings of cognitive research should have cleared such concerns up. Indeed, as we saw, not only are atheists are on average more scientific savvy than religious believers, but it would seem certain atheists are better informed than other fellow atheists as well. Baggini feels this position that reason is only on the side of atheist intellectuals is damaging to the atheist movement by being divisive and amounts to little more than thinly veiled snobbery. Secondly, religious beliefs may have at one time been based off of reason, i.e. for a religious person in the past a reasonable explanations for why there is thunder and lightning would be that Hephaestus was pounding away on his anvil forging lightning bolts for Zeus, or early Jewish fishermen on the Mediterranean getting caught in a turbulent squall may have thought that God’s wrath was upon them. But now with the advent of modern scientific understanding, such as meteorology, the cognitive sciences, biology, cosmology, and every field in between, we know with some assuredness that such superstitious supernatural explanations are entirely bull, bunk, and bogus. Therefore to believe it in spite of the evidence makes the belief in the superstition all the more unreasonable. Contrary to what Baginni believes, this doesn’t make the religious believer less rational in their facility of thought, but it does make their conclusions irrational for the fact that their faith based beliefs cater to the credulous rather than the credible. As Michael Shermer has so eloquently stated, “Smart people believe weird things because they are skilled at defending beliefs they arrived at for non-smart reasons.” People who were never raised with or indoctrinated with religious beliefs, and who never were never devotedly religious, often fail to appreciate the consequences of this dilemma. Faith-based atheism? Yes, alas. Atheists display a credulous and childlike faith, worship a certainty as yet unsupported by evidence—the certainty that they can or will be able to explain how and why the universe came into existence. (And some of them can behave as intolerantly to heretics who deviate from their unproven orthodoxy as the most unbending religious Inquisitor.) …. Atheists have no evidence—and certainly no proof!—that science will ever solve the question of why there is something rather than nothing. Rosenbaum has it all wrong. Atheism simply refers to the lack of belief in the supernatural and personal God(s), but as for the atheist herself and whatever else she may believe, there is an unlimited variety of peoples and differing trains of thought. If an atheist believes in rationale arguments, evidence, and the merits of the scientific method, this doesn’t make them quasi-religious. Also, Rosenbaum doesn’t seem to grasp that a scientific theory, supported by evidence, is more believable than a religious claim which is without. How he manages to miss this is beyond me, but later in the article he goes on to critique all the wild cosmological models atheists like to cite as support for why the belief in God is untenable. Rosenbaum goes on to add, “Just because other difficult-seeming problems have been solved does not mean all difficult problems will always be solved. And so atheists really exist on the same superstitious plane as Thomas Aquinas…” By the sound of his rant, however, Rosenbaum sounds like an angry theist out to “right” those damned new atheists no matter what it takes. What conviction! Just because not all difficult problems will always be solved doesn’t mean that some difficult problems sometimes won’t be solved. Here Rosenbaum makes the same mistake he is accusing the new atheists of—of being dogmatically certain. Atheists aren’t saying they “believe” with “certainty” that science will answer everything. Rosenbaum’s complaint about atheists utilizing theories such as multiverses and vacuums (I think he means the weak anthropic principle and fecund universes), something he finds utterly unconvincing, is misconstrued as atheistic faith that the theories are undoubtedly true. Nobody has claimed that these theories are proved, let alone represent the final truth. What they do represent however, is trust in the scientific method over trust in supernatural explanations. Atheists offer natural scientific models to explain how a universe like ours came into existence without the divine will or creative powers of a God. By putting forth a scientific model which is based off observation and supported by the cooperative evidence is an empirical attempt to explain something without having to resort to the supernatural. It’s not that any one of us is one hundred percent positive that any one theory is the right model, I don’t think any of the new atheists have boasted such certainty. But what we are saying is that you don’t need God to explain it all—and we have real empirical models which explain things better and more accurately than a supernatural supposition. What need is there then to appeal to the supernatural to explain it? Yes, in all truth we could very well end up being wrong. Science may not currently explain the origins of the universe and why we’re here—even though it might someday—but that’s not the point now is it? The point is that science explains enough for us to know that the personal God of the Bible could not possibly be behind the creation of the universe, and so there must be another explanation, and since the supernatural has been largely rule out we must look toward natural explanations. This simple point has completely gone over Rosenbaum’s head and those like him who mistake confidence in the prowess of science for faith-based certainty. So the self identifying agnostic Rosenbaum is so wrong about atheism, and his assumptions are so utterly ignorant, that he’s not even wrong. And Baggini, an outspoken atheist himself, is mistaken about both new atheists misconstruing religion and misunderstanding atheistic principles. In fact, if you pick up the literature and give it a chance I think you’ll find that the New Atheism is better equipped than any secular ideology before it to adequately address these issues. It is atheism enhanced and revised for today’s modern audience. Note: Usually Wikipedia provides a useful overview, albeit unofficial, but in this case they provide an even more useful list of reference materials. Here I am citing Wikipedia specifically for the convenient collection of resources and all the direct links to polls and data it provides. Please consult the References section at the bottom for a long list official data and polls which show the steady growth of atheism worldwide and the rapid growth within the U.S.
My feeling as a Christian points me to my Lord and Savior as a fighter. It points me to the man who once in loneliness, surrounded by a few followers, recognized these Jews for what they were and summoned men to fight against them and who, God's truth! was greatest not as a sufferer but as a fighter. In boundless love as a Christian and as a man I read through the passage which tells us how the Lord at last rose in His might and seized the scourge to drive out of the Temple the brood of vipers and adders. How terrific was His fight for the world against the Jewish poison as a Christian I have also a duty to my own people. We might note how by Hitler’s own words we find the inglorious truth of the matter. Rather than atheism, we find the religious influence of age old Anti-Semitism (as practiced by the Christian Church) behind his ideological make-up and pogrom of ethnic cleansing. Speech cited in Letter to a Christian Nation, p.14, originally from Norman H. Baynes, ed. The Speeches of Adolf Hitler, April 1922-August 1939. Vol. 1 of 2, pp. 19-20. Oxford University Press, 1942. Thomas Jefferson letter to Thomas Law, June 13, 1814. Benson, et al., “Study of the Therapeutic Effects of Intercessory Prayer,” American Heart Journal, Volume 151, Number 4, April 2006. See: Reasonable Faith: Christian Truth and Apologetics by William Lane Craig, Warranted Christian Belief by Alvin Plantinga, Simply Christian: Why Christianity Makes Sense by N.T. 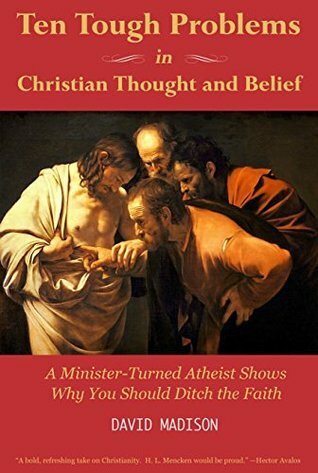 Wright, Defending Your Faith: An Introduction to Apologetics by R.C. Sproul, The Apologetics of Jesus: A Caring Approach to Dealing with Doubters by Patrick Zukeran and Norman L. Geisler, The Recalcitrant Imago Dei: Human Persons and the Failure of Naturalism by J.P. Moreland. Regardles of whether or not you find their arguments compelling, let alone defensible, reading these works will give you the general idea of the climate of contemporary Christian apologetics. Read philosopher Graham Oppy’s book Arguing about Gods in where he shows how strong agnosticism is self contradictory and indefensible, whereas weak agnosticism, albeit defensible, is not satisfying since it basically equates to indecisiveness. Either we are capable of knowing something, at least capable of testing something thereby figuring it out, or not knowing anything because it is untestable or lies outside of the limits of epistemic knowledge. Agnosticism, the claim of not having enough information to decide either way is unsatisfactory because, at any given moment, we do have enough information to cause us to lean toward a probable truth claim. Since ultimate knowledge (on every subject) is impossible, however, we could never make a definitive truth claim, therefore agnosticism is indecisive on any given choice. Yet daily we are called upon to make affirmative choices without having all the evidence, so genuine agnosticism is philosophically invalid. However, I accept the term of agnostic as a substitute for atheist by those who want to distance themselves from the negative impression “atheism” leaves. A nonbeliever who does not necessarily oppose theism may, in fact, choose to call herself an agnostic. I find such a strategy not only useful but sometimes necessary. Yet the key difference between agnosticism and atheism should not be overlooked: atheism concerns itself with the rejection of a faith claim, whereas agnosticism concerns itself with what is ultimately knowable. The prior being concerned with affirmations of faith while the latter being concerned with affirmations of knowing. This is where Rosenbaum misconstrues agnosticism, by claiming atheists are concerned with knowing—if so then what use is calling oneself agnostic? Atheists are concerned with being honest with what we can or cannot possibly know, but the rejection of theism need not be predicated on having an ultimate knowledge on the subject, it may be rejected on the basis of its own inherent weaknesses, such as loaded fallacies, philosophical contradictions, and general incomprehension (such as the invisible pinkness of unicorns or IPUs for short). Rosenbaum might wish to study Steve Eley’s IPUs in more detail, since this next comment clears up the misconception, “We have faith that the unicorns are pink, but we logically know they are invisible, because we cannot see them.” Thus atheism can be sustained even when a position of ultimate knowing is not attainable, since we reject the pinkness of unicorns which do not exist simply on the basis of its own unintelligible nature—the same goes for faith claims in God. The weak anthropic principle may be logically unsound, but the strong anthropic principle is at least, in principle, feasible. See: Lenord Susskind’s The Cosmic Landscape: String Theory and the Illusion of Intelligent Design. Also see Lee Smolin’s The Life of the Cosmos for more on fecund universes (also called cosmological natural selection theory). An argument that appears to be scientific is said to be not even wrong if it cannot be falsified (i.e., tested) by experiment or cannot be used to make predictions about the natural world. The phrase was coined by theoretical physicist Wolfgang Pauli.